Have a couple of hours to spare? Then why not take in the entirety of Shakespeare’s oeuvre in a single evening. This irreverent romp through all of Shakespeare’s comedies, histories and tragedies leaves audiences breathless with laughter. 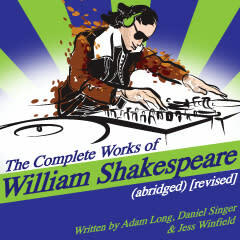 The Complete Works of William Shakespeare (abridged) [revised] employs a madcap pace and contemporary tropes to delight audiences and demystify some of the most fundamental pieces of English theater. 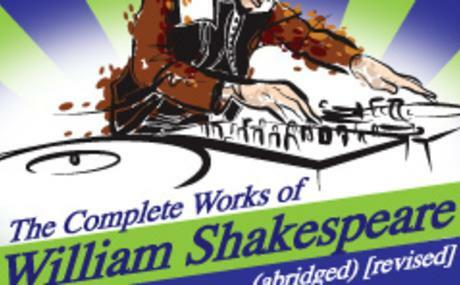 The hilarity begins with a cynically narrated version Romeo and Juliet, then veers farther off the rails as the actors present Titus Andronicus as a cooking show and Othello as a rap number. Julius Caesar and Antony & Cleopatra get very short shrift and the players liven things up by presenting the historical plays as a football game. The players tackle the Sonnets in Act II followed by a famously brief production of Hamlet.